The Qur’an contains the revelations of Allah, the Creator and Sustainer of the Universe, to mankind. It is the message from God to man and therefore of utmost importance to us. To properly grasp a message, one needs first of all to understand its contents exactly, and for this purpose one must study the Qur’an deeply and in detail. In fact, some people do spend their whole lives studying the Qur’an, reading and reflecting upon it and, as they grow and develop, both physically and spiritually, they discover for themselves new meanings and implications. Secondly, some special knowledge of the circumstances that surround the message is also necessary for fuller understanding of its meaning and implications. Although some part of this special knowledge can be derived from the Qur’an itself, there remain other areas of knowledge that can only be discovered by wider study and research. Muslims have from earliest times, applied themselves not only to the message from Allah the Qur’an but also to its setting and framework, and the preoccupation with these ultimately developed into the ‘sciences’ of or ‘knowledge’ about the Qur’an, known as “ulum al-qur’an’. Third, apply the message of the Qur’an by ordering your personal life as well as the life of society according to its message. The aim of this book as all ‘ulum al-qur’an is to help towards a better understanding of the Qur’anic message by providing information on its setting, framework and circumstances. 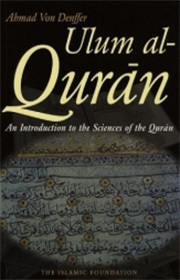 To a great extent it is a descriptive account of the traditional subject of ‘ulum al-qur’an. Some branches of ‘ulum al-qur’an, such as the divisions of the text, style, literary form etc., have only been touched upon briefly, while others that seemed more important have been dealt with in more detail. In particular such topics related to the understanding of the text (asbab al-nuzul, al-nasikh wa al-mansukh, etc.) have been treated more extensively while others, such as the ‘seven ahruf’ or the ‘Uthmanic writing, which are of benefit only to readers with a good knowledge of classical Arabic, have been introduced, but not elaborated upon.